The story of this cocktail (highball, technically) begins at Montreal's Macaroni Bar, where the PhoBlograpHusband and I have parked our kiesters atop bar stools recently (although mine barely fits nowadays) because that's now where Tao and Tony work. They're pretty much given free rein behind the bar there, creatively speaking, so long as they also keep up with customer demand for vodka sodas and pitchers of sangria. Speaking of pitcher drinks, the last time we were there, Tony told us about some summertime refreshers he's been tinkering with, including a fresh lemonade made with a rosemary-infused simple syrup. He let us try some, and upon first sip, I was awash in an aura of complete summertime relaxation spiked with my ever-bubbling-near-the-surface total jealousy. 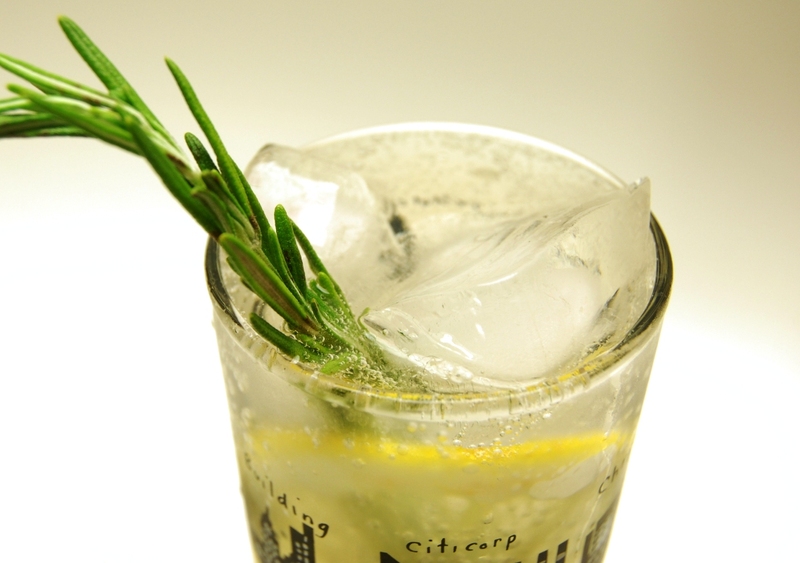 How had I never thought of rosemary lemonade myself? This pitcher gizmo corrals your sliced-up fruit/veggies/herbs/what have you down the center of the pitcher instead of letting them float all willy-nilly on their own. I'm not sure how overall effective that is but it sure is fun to play with. 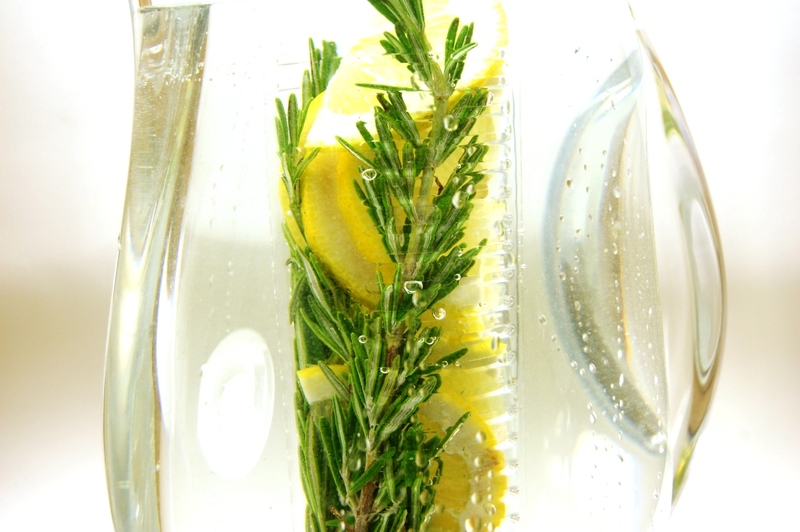 And speaking of fun to play with, the best thing I could think to do to a pitcher of lemon and rosemary-infused water was to carbonate it with our trusty Sodastream. We are now talking refreshing, dry and crisp variety, turned up to 11. Such a mixer will easily pair with your clear, aromatic spirit of choice: gin, eau de vie, or in the case of the Fizzbite, NY-state grappa distilled from Gewurtztraminer grapes. Sean actually found the Fizzbite too bitey, but I loved the parade of sting-->grappa's sour apple notes-->more seltzer-y sting-->lemon tartness-->rosemary essence marching down my gullet. Fill your highball glass of choice with ice. Pour in grappa. 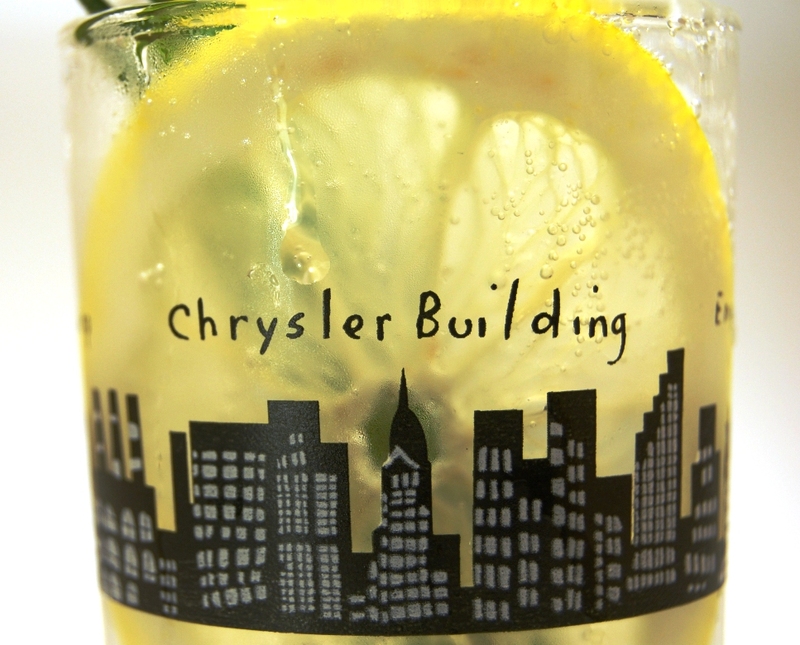 Fill with club soda and garnish. FYI, we infused the plain water for a week-ish before carbonating, although we could've stopped at half that. 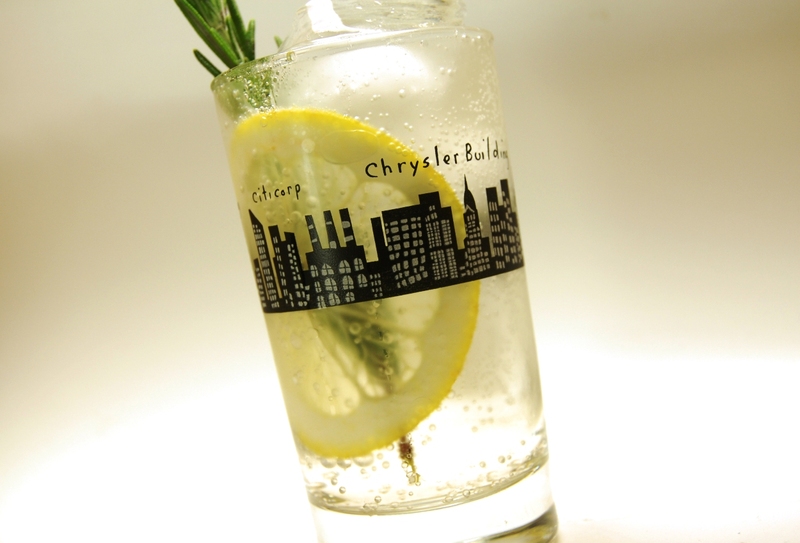 When carbonated, the rosemary-lemon soda water took on an almost peachy-pink tone. I don't know why... science question? Tastes fine, though, I am still drinking and enjoying the soda water straight. I am writing to you from on a cocktail high. It's almost noon yet I'm still riding my 3 a.m. buzz. 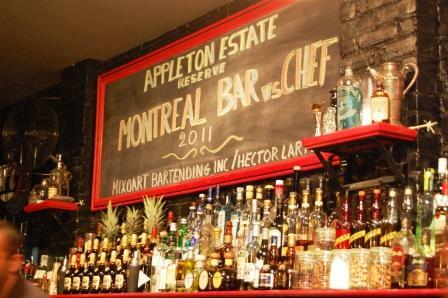 Last night, I competed alongside 11 of the city's best bartenders in the first-ever Montreal Bar vs. Chef competition. It was like PROM FOR COCKTAIL NERDS!!! 2) A cocktail of your own creation which you produced on site for the panel of five judges and, as much as feasible, for the crowd at large. We had about a month to come up with our recipes. You needed to use at least one ounce of Appleton Estate Reserve, and the drink in total could only contain two ounces of alcohol, max. That was hard. Usually two ounces of alcohol is what I call "Step 1." 3) Five minutes before you were up (I went 9th out of 12), you got to open your "mystery box" of ingredients, so you had to make a second drink off the top of your head using Appleton Reserve plus everything that was in your box (that's what she said -- they do get that joke in French Canada, by the by). As soon as I get a chance to recreate it, I will blog that recipe of mine, which was AWESOME! Srsly, of myself I have rarely been prouder. My mystery ingredients were a pineapple, a bunch of carrots, rosemary, agave syrup and some weird wild carrot essential oil. I muddled the rosemary and the carrot greens (oh yes I did!) with Appleton and Hendrick's, then shook that on ice with the agave syrup, some lemon juice and some Cynar. I used a slice of pineapple to coat the inside of my cocktail glass Sazerac-style, treated the rim with the carrot oil, strained my shaker contents into the glass, and lastly garnished with two thin carrot peels laid across one another like an X. I used up every second of my allotted time, which was very exciting. Honestly, the cocktail was great and tasted like nothing I'd ever had before. I was asked to name it on the spot and I said, "The Carrot Top!" (This is doubly funny because I am a redhead.) I got very lucky. But back to #2, the recipe I made up in advance and brought with me -- with that, I was not particularly lucky. I wanted to make a swizzle because I've had experience with them and I'd never seen one up here; in fact, I'd polled the LAB bartenders beforehand and they'd never heard of it. A swizzle seemed like a cocktail that I could do with the right amount of bells and whistles. Meaning, you definitely want to show off a bit, do something different, be clever, yada yada, but not to the point where you're serving up a Rube Goldberg machine on the rocks. Guess what the guy who went 8th made? A swizzle! In a coconut shell!! omg, I was ready to crawl back to my hovel of shame. Sean and Gabrielle -- the first LAB bartender we met, who also competed last night and is just sweet and adorable -- had to psych me back up. 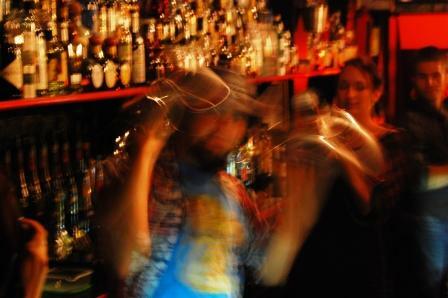 Then I actually got behind the bar and I... messed up. See, you had only half a bar to work with (on the other side, real bartenders were serving actual customers), no barback, and you were behind a bar you've never been behind before. 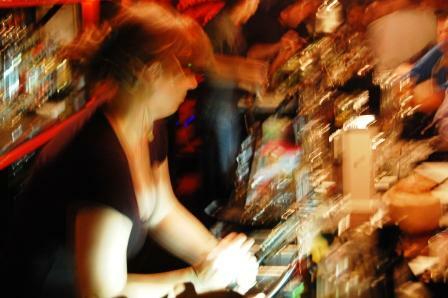 (And I'd never been behind any bar for almost three years. And I'm doing all of this in Frenglish.) My mise en place was royally scattershot, as was I. There were numerous jiggers at my disposal and I must have picked up the wrong one at some point. So I wound up with too much drink, but since you build a swizzle in the glass (as opposed to a shaker, say) I couldn't just leave some liquid behind in my hypothetical shaker to correct this. My Pilsener glass runnethed over, is what I'm saying. Second, only after all that did I then realize that I forgot to put my lemon juice in entirely! Ay yi yi. But I was pretty lucky in the end because the swizzle stood up well despite all this. So now let's talk in more positive terms (someone on my Facebook feed just informed me that today is "Positive Thinking Day") about this lovely drink I done invented. Thanks to the Robert Johnson Swizzle, I know that I really like bourbons in swizzles, and as Sean said a few days ago, "This is you. You cannot enter this contest without some bourbon." 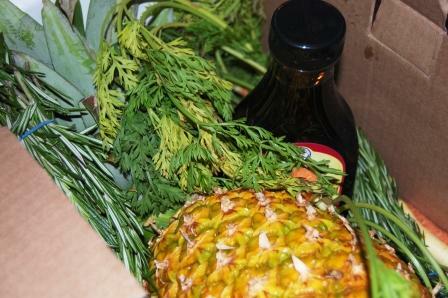 The cilantro syrup brought out the spicy/tart/fizzy qualities of the shrub syrup. 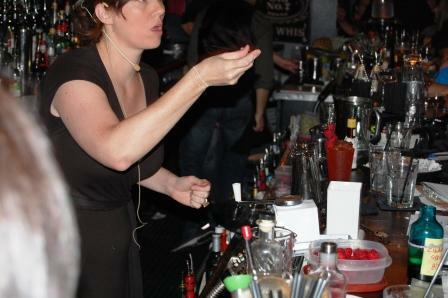 The raspberry garnish just gives your nose something fun to waft while the drink's going down. In the end, Gabrielle won the contest (Congrats, m'amie!) with a fantastic apple-y cocktail. I'll see if I can get the recipe from her. In fact, in the coming days I'll get as many of the recipes as I can, as well as better pics. (Sean couldn't get close enough last night to shoot my swizzle.) I met lots of wonderful people last night, not including that one guy who was clearly just trying to get an up-close view of my cleavage but thankfully he was not one of the bartenders and finally retreated after I blatantly played with my wedding ring long enough. I finally have Facebook friends in Montreal! I hope some of them are reading. Smile! Combine rum, bourbon, Pimm's and bitters in a mixing glass. (No need to stir or shake, you'll swizzle later.) Fill a Pilsener glass with crushed ice. Pour contents of mixing glass into Pilsener. Add lemon juice and syrups into glass. Swizzle. Serve with a slender straw that's been skewered with fresh raspberries.